Meghan Markle has had a taste of royal life, as she joined her fiance Prince Harry on their first joint official public engagement in Nottingham. Excited crowds cheered as the couple greeted well-wishers ahead of a visit to a World Aids Day charity fair hosted by the Terrence Higgins Trust. They split up to talk to people lining both sides of their route and were given cards, flowers and chocolate. After the charity fair, they met head teachers at a nearby school. Well-wishers gathered in the city ahead of the visit to catch a glimpse of the couple, including Helena Bottomley, Zoe Scott and Carole Bingham, from East and West Bridgford. Ms Scott said: "We love the royals. We are genuinely happy for Harry." "We all had our children at the same time as Diana [Princess of Wales] so we feel a real allegiance. She would be so thrilled," said Ms Bottomley. The couple announced their engagement on Monday and are due to marry at Windsor Castle in May. One of the people Prince Harry stopped to speak to was Julie Ball, 51, of Netherfield, who said the prince had commented on her Santa gloves. "He said 'great gloves' and pulled one down over my fingers," she said. "I said they're from Primark for £3. "When Meghan walked past she said the same thing. She said, 'We have the same taste.'" How will Meghan Markle become a British citizen? Another member of the public shouted to Prince Harry: "How does it feel being a ginger with Meghan?" 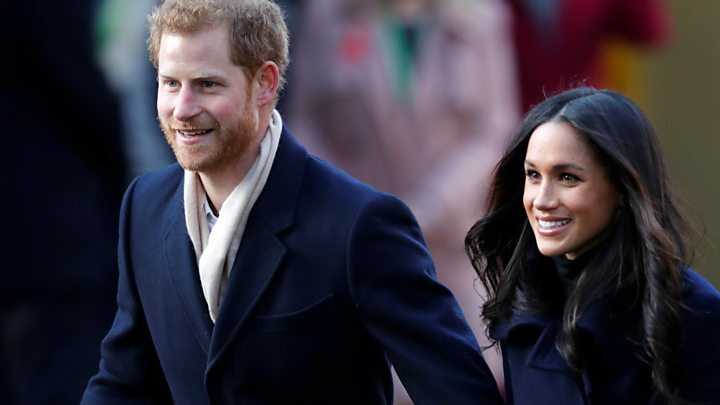 Dickie Arbiter, former royal spokesman, told the BBC the couple took their time to talk to as many people as possible on their 30-minute walkabout. University of Nottingham students Raushana Nurzhubalina, from Kazakhstan, and Jenn Galandy, from Canada, set their alarms for 06:00 GMT to get a prime spot to try to see Prince Harry and Meghan Markle. "It is such an honour to see the royals," Ms Nurzhubalina said. "I'm also a fan of Suits, so it is a chance to see a star of that too." Royal fan Irene Hardman had a goody bag ready to hand over to the couple, including copies of the local paper and two fridge magnets "so they don't fight over it". Speaking afterwards, the 81-year-old said: "I cried - she's wonderful, and it's fantastic. They're so genuine." By the time the royal couple arrived, the pavements in the Lace Market were packed. 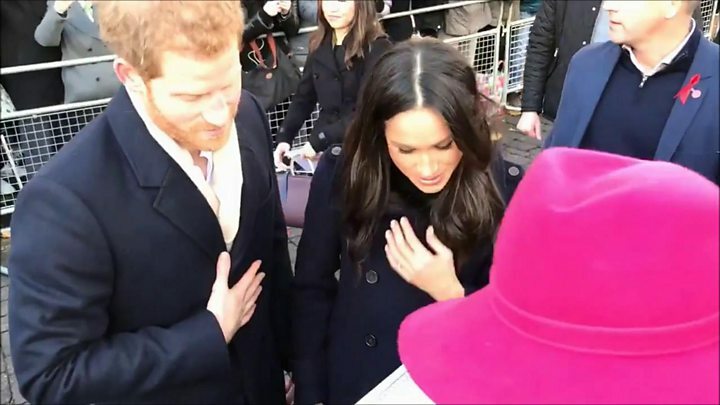 Prince Harry and Meghan spent around half an hour meeting the people of Nottingham who had come out in force despite the cold. Meghan appeared very relaxed and perfectly at ease. This was her first official royal engagement with Harry and if she was nervous at all it did not show. She smiled, she chatted, at one point she even picked up someone's glove and handed it back to them. This was a confident first public appearance. The couple split up at points to cover both parts of the pavement and meet the maximum number of people. Meghan was happy to shake hands with the crowd and as she wasn't wearing gloves, the ring was on show. Tactile with her fiancée and the crowd - it's fair to say the response from the people was overwhelmingly positive. After the walkabout, Prince Harry and Ms Markle went to the Nottingham Contemporary Exhibition Centre for an event to mark World Aids Day. Dominic Edwards, from the Terrence Higgins Trust, told the BBC the charity was "thrilled" the couple had chosen to visit Nottingham, and said: "I think it really underlines his great support for HIV as a cause." Royal commentator Richard FitzWilliams, said this visit represented a link with the legacy of Princess Diana's influential work on HIV 30 years ago and was "no coincidence". Prince Harry has spent time in Nottingham both publicly and privately since he first met young people there in 2013, when he was exploring issues around youth violence. A year later, he established the Full Effect programme, which aims to stop youth violence in the city. At Nottingham Academy, the couple will watch a "hip hopera" and meet students. The handbag Ms Markle chose to carry on her Nottingham visit has already sold out. The bag was made by the Scottish label, Strathberry, which said "it was a fantastic surprise" to see the bride-to-be carrying one of its designs. Ms Markle was wrapped up in a long navy coat by Mackage - a brand also favoured by actresses Gwyneth Paltrow, Halle Berry, Eva Mendes and Blake Lively. She wore the coat over a beige cotton, full midi skirt from British-based fashion label Joseph, priced at £595, which also sold out on the brand's website. On Tuesday, the couple's spokesman said Ms Markle would not be continuing her work on gender with the United Nations or with other organisations and instead would start new charity work as a full-time royal. She will also become the fourth patron of the Royal Foundation of the Duke and Duchess of Cambridge and Prince Harry. The foundation is behind Prince Harry's Invictus Games - the Paralympic-style competition for injured servicemen and women and veterans - and also the mental health charity Heads Together. It has also been announced that Ms Markle intends to become a British citizen and will work towards it in the coming years.